One of the tally - a typical Evesbatch common: not a wildie, although the pool does contain 'em. This one, 10lb 15oz. October 2018. A bullet-headed torpedo of a carp, ticking all the boxes for me as a wildie... October 2017. I've just returned from a hectic Evesbatch session with my brother David and my nephew, Steven. We all caught pretty steadily, despite some terrific gusts of wind. Luckily, Evesbatch Bottom Lake is quite sheltered. I opted to sight-bob luncheon meat under a small bush where, a few weeks ago, I spotted a few sizeable fish. My final tally was eleven carp - with the best two going 10lb 15oz and 9lb 9oz - not monsters, but hard fighting classic English commons, in the very peak of condition. All my carp fell to the sight-bob technique, except for the last one which I fooled with surface crust. ( I'm not really happy unless I've caught at least one carp off the top!) I was a little disappointed that none of the pool's very distinctive wildie-type commons were in my 'bag' today. I expect, actually, they are rather scarce in the pool. 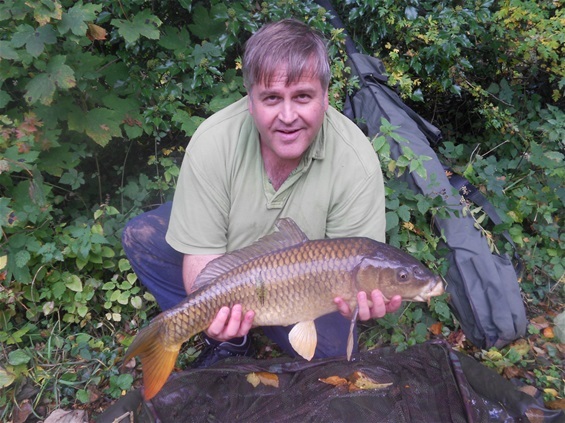 David, however, managed two in his catch of six carp, with one going 3lb and the other 5lb. 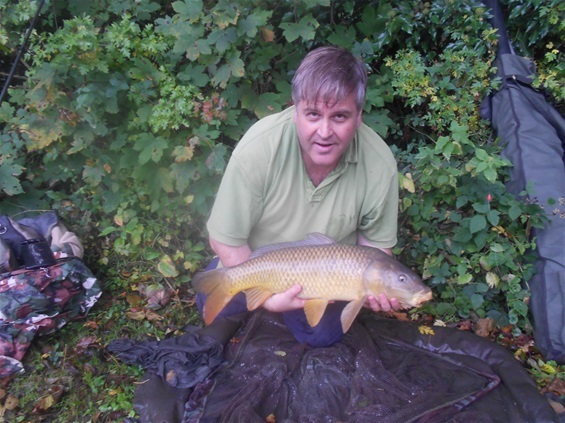 Steven, fishing off the dam, caught ten carp, to just over 9lbs, and he also had a red letter day with the perch: catching two of 1lb 8oz and a PB of 2lb 1oz. I don't know what it is, but each time he fishes Evesbatch, Steve manages to get a PB of some sort! Lucky devil! We caught far more carp than we expected, given the wild autumnal conditions, and most were hooked little more than inches away from the bank. We were surprised, then, to see how two other anglers were struggling on the far bank - only managing one modest-sized carp between them all day, from what I could see. I noticed bite alarms and suspected PVA bags etc - but it just goes to show that the techniques one reads about in the modern carp magazines are not always the most effective on the day. It was, all told, a very enjoyable autumn session for us, and my only regret was that, due to circumstances, we couldn't all enjoy a beer and a good natter together afterwards; but there's always another time, and I look forward to that. 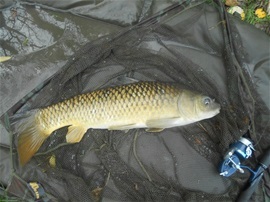 I find myself wondering about the origins of the carp in Evesbatch Bottom Lake. Some folk insist the commons are truly old stock - even effectively wildies, going back donkeys years in heritage to a time, perhaps, when the estate was owned by the Cadbury family - of chocolate bar fame. The first time I fished the two acre pool, about one month ago with my nephew, Steven, the commons we caught were certainly beautiful, in magnificent condition and - in my opinion, clearly an 'old' type of common, with more than a hint of the Leney about them. 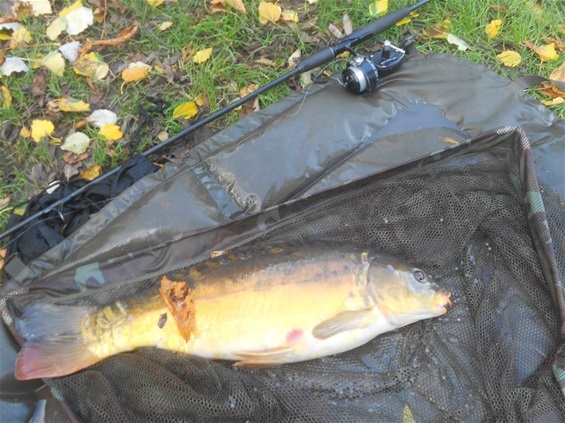 I did not quite rule out some "wildie' ancestry, but with fat king carp mirrors also thriving in the pool, I decided that the ancestry of any common there would certainly be 'mixed' by now....But one carp I caught at Evesbatch yesterday (October 14, 2017), has made me think again - because for me it ticked all the boxes as a big wildie. It was getting on for, I'd say, 30 inches long but weighed 'only' 7lb 10oz.. Of course it fought - a screaming first run then hanging low, pectorals no doubt spread, in the manner of a barbel, until my arm was aching. It was not the largest fish of the day - that was a lean and mean common going 10lb 6oz, and not even the second largest - that was a half-tone mirror, of 8lb 11oz - but it was was far and away the most intriguing. It even had the little straight run on the dorsal - from the main front ray to the dorsal slope - which I take to be a wildie characteristic. Either way, yesterday was a very good day - with ten carp landed in total - two on sight-bobbed luncheon meat and the rest on surface bread. I also caught eight bream, on luncheon meat - but let's not go there! - a perch and a rudd. All in all, it was a most memorable autumn session. 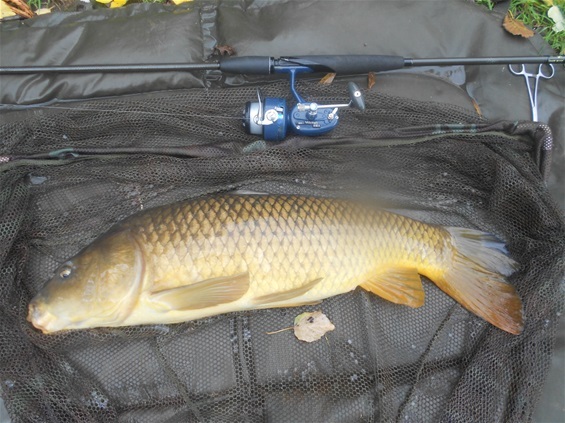 My best carp of the day - a lean and mean common of 10lb 6oz. October 2017. A good many of the mirrors in the pool have this attractive "two-tone" look. My second best common of the day - October 13, 2018.
that day was rough, weather-wise, but the carp still fed....! Looking forward very much to our session.